Greywaren Art: May Artist Project -- Group Hug! 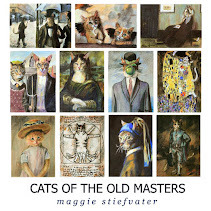 I'm revoltingly pleased that some of my blog readers joined in on the May Artist project. Artists I would've never even thought of looking at! Here are the links to the bloggers who highlighted artists on their blogs. I wish I could show all of the artists here as well, but I'm sticking to the Safely Dead (and Beyond Copyright) artists here. Gillian McMurray did a post on Franz Marc (his foxes are there at the left -- aren't they just the coolest ever?) I'd seen a sleeping dog piece of his before, but never these foxes. Meg Lyman did a post on the hilarious and talented Will Bullas -- definitely worth going over and taking a look. 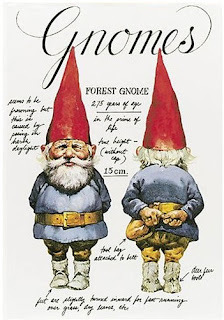 Sheona Hamilton-Grant did a post on Rien Poortvliet, the illustrator of one of my absolute favorite books as a kid -- the Gnomes book (which is sadly now out of print and I'm going to have to scramble to find a copy because I must have it for my two ankle-biters when they get a little older). Jo Castillo did a wonderful post on a Dangerously Alive artist (as Tania dubbed those who are not Safely Dead), Tom Christopher, who works from life. He has a particularly gorgeous piece on her blog called "Winter Light" that I loved. What great examples - and a nice range of styles. I particularly enjoyed Jo Castillo's take on Tom Christoper - nice to be reminded that good work isn't only done by long dead, far away artists. This has been a wonderful project. I so enjoyed looking at the entries on everyone's favourites. I noticed that the influence of the natural world was heavy in peoples' choices. Landscapes and animals - you can't beat 'em. Wonderful examples. Thanks for asking us to take part. It's a pity more folk didn't take you up on your challenge. I'm so fond of Franz Marc !!! 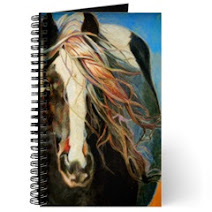 And i love to paint horses!But I paint just for fun ! Great blog! Added to my favourite! Great blog and some great work! This was fun, hugs all around from me, too! I am learning in spite of myself. Always easier when you are enjoying the work. Interesting to see all the different artists. Thanks, Maggie, for keeping us on our toes. I just discovered your blog and it's been the most educational 15 minutes I've spent in a very long time. Thanks for this wonderful series - and for inspiring others to do the same.